Chennai based Consumers Association of India (CAI) is a voluntary organization that has served in the area of consumer protection for the past 15 years and has been running the State Help Line for Tamil Nadu Government for the last two years along with its own complaints handling service. Taking this to the next level, CAI is organizing an event to bring manufacturers, service providers and customers together to discuss and resolve consumer grievances without delay. 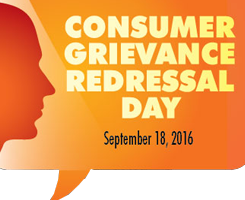 The event titled “Consumer Grievance Redressal Day” is set to be held on September 18, 2016 from 10.00 a.m. to 6.00 p.m. at Mother Teresa Exhibition Hall near Valluvar Kottam, Chennai. CAI has joined hands with the Civil Supplies and Consumer Protection Department of Tamil Nadu Government for this venture.